Grades for the fall 2018 term are due by 5 p.m. Tuesday, Dec. 18 for term courses with final exams given Monday, Dec. 10 – Friday, Dec. 14. Grade rosters will be available in KSIS for grade entry after 5 p.m. Friday, Dec. 7. Students will be able to view grades for regular courses in KSIS starting after 8 a.m. Wednesday, Dec. 19. 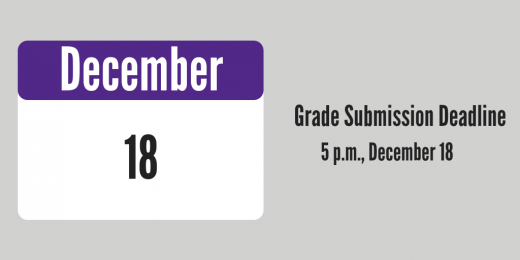 See the Final Grade Submission Information – Fall 2018 page for more information about grade submission deadlines.